Guantanamo detainee Omar Khadr has been transferred to his homeland of Canada to serve the remainder of his sentence, Canada's Public Safety Minister Vic Toews said Saturday. Khadr boarded a military plane at the Guantanamo Naval base in Cuba and will be transferred to a maximum security prison somewhere in Canada. The case and the prisoner's legal fate have sparked controversy among Canadians. Many think his sentence has been too lenient. Under a plea deal with military prosecutors in October 2010, Khadr admitted to being responsible for the death of Sgt. First Class Christopher Speer, a member a U.S. Army Special Forces Unit. He pleaded guilty to murder, attempted murder, providing material support for terrorism, spying and conspiracy. During a 2002 firefight in Afghanistan, Khadr admitted to throwing the grenade that killed Sgt. Speer. 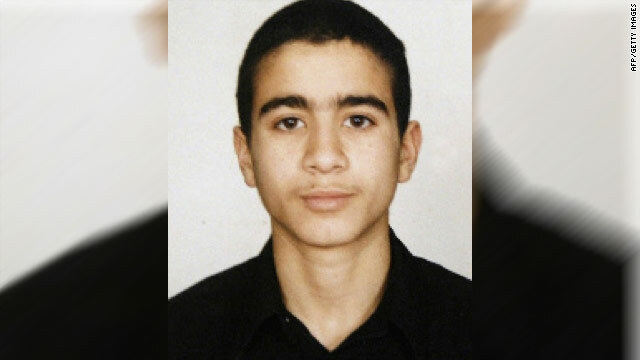 Khadr was just 15 at the time. Hillary Clinton painted a chilling picture for the 20 or so foreign ministers from the Friends of Syria group meeting Friday on the sidelines of the U.N. General Assembly. "We see more bodies filling hospitals and morgues, and more refugees leaving their homeland and flooding into neighboring countries," Clinton said in her address. "The regime of Bashar al-Assad must come to an end so that the suffering of the Syrian people can stop and a new dawn can begin." Yet ideas on how to bring about that new dawn are in short supply, as the international community remains unwilling to act. Proposals by Qatar to establish an Arab force to stop the bloodshed, and calls by France and Turkey to create a no-fly zone to protest "liberated" areas have met lukewarm resistance by the U.S. and other nations without a U.N. Security Council resolution. The meeting discussed efforts to create an all-inclusive transitional government and increase aid to address a growing humanitarian crisis. Clinton pledged $30 million to help Syrians affected by the violence - both those inside the country and the tens of thousands of refugees pouring into neighboring Iraq, Jordan, Lebanon and Turkey. Clinton also announced $15 million in additional non-lethal aid for communications gear and training. The funding for activists, students and journalists will be used to help the opposition communicate and prepare for political transition. But it will also help train civil servants to deliver essential municipal services in areas that have been abandoned by the regime. That could mean, officials say, anything from ensuring electricity flows to homes, to rebuilding schools to baking bread. More than eighteen months into the conflict, which activists say has killed around 30,000 people, diplomats say the lack of unity among the opposition regarding a vision for a post-Assad Syria remains one of the greatest challenges. One of the main goals at Friday's meeting was to discuss ways to strengthen coordination among Syria's fractured opposition groups. Members of local groups from across Syria and exiles with the Syrian National Council attended the session. But complaints about Syria's splintered opposition have been matched by frustration over the international community's own paralysis. Lakhdar Brahimi, the U.N.-Arab League representative for Syria, warned the Security Council that the situation in Syria continues to worsen. Five weeks into the job, he acknowledged he had a few ideas but no new plan to stop the bloodshed. Brahiami's predecessor, Kofi Annan, resigned in frustration after Russia and China vetoed three Western-backed resolutions aimed at pressuring Assad to end the violence and begin negotiations over a political transition. A framework transition plan agreed to in Geneva by the permanent members of the Security Council remains on the table, but can not be implemented before an agreement is struck with Russia over how it's implemented. "It is no secret that our attempts to move forward at the U.N. Security Council have been blocked repeatedly, but the United States is not waiting," Clinton said. 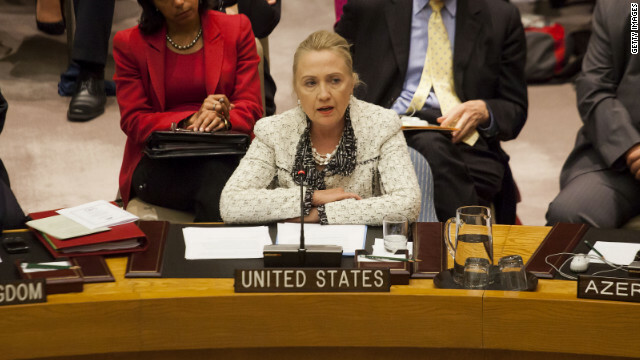 She issued a stern warning to Hezbollah, and its backer, Iran, to stop supporting and arming the Syrian regime. "There is no longer any doubt that Tehran will do whatever it takes to protect its proxy and crony in Damascus," she said. Arab League Secretary General Nabil ElAraby told the meeting that it is time for a political transition in Syria because the situation is becoming "more explosive." "The Syrian people are looking for us here," he said. If those at the meeting truly are the friends of the Syrian people, they must "take concrete and practical steps to end this tragic and indeed dangerous crisis, to save the lives of innocent people and to save Syria and the whole region from the scourge of a more expanded civil war and more tragedies of massive proportions." Another disturbing development involving the worsening crisis in Syria. Defense Secretary Leon Panetta revealed U.S. intelligence shows Syria has moved some of its chemical weapons for security purposes. It's a red line that the president has warned the country against crossing. Pentagon Correspondent Barbara Starr has the latest. Rep. Peter King calls for U.S. ambassador Susan Rice to resign for what he says was misleading comments about the attack on the U.S. consulate in Libya. Key nations of the "Friends of Syria" group met in New York Friday to strategize, once again, on how to give more help to the Syrian opposition. Secretary of State Hillary Clinton announced another $15 million in aid, for a total of almost $45 million, for what she called the "unarmed opposition." The U.S. intelligence community has revised its assessment of the deadly attack on the American consulate in Libya, saying it now believes it was a deliberate terrorist assault. In an unusual statement on Friday, the Office of the Director of National Intelligence sought to explain how it has revised its view of the September 11 attack on the diplomatic post that killed Ambassador Christopher Stevens and three others. The assessment moves away from the initial belief the attack began spontaneously following a protest over an anti-Muslim film. The intelligence community now believes it was "a deliberate and organized terrorist assault carried out by extremists" affiliated or sympathetic with al Qaeda. The statement represents the fullest accounting yet of the intelligence community's changed understanding of the attack, and suggests it is trying to distance itself from the political debate over whether the Obama administration is being fully forthcoming about its understanding of events. The tightrope Lebanese Prime Minister Najib Mikati has been walking on neighboring Syria has gotten more difficult in the past year. In an interview with CNN's Elise Labott this week at the United Nations General Assembly, Mikati made it clear that his country must stay neutral in the Syrian civil war. He has had to avoid criticism of Syrian President Bashar al-Assad, which he believes would upset the political balance in Lebanon. "We are saying, please, we don't want to interfere," Mikati told Labott. "We cannot do anything. Don't ask from Lebanon things that are beyond our capability to do." 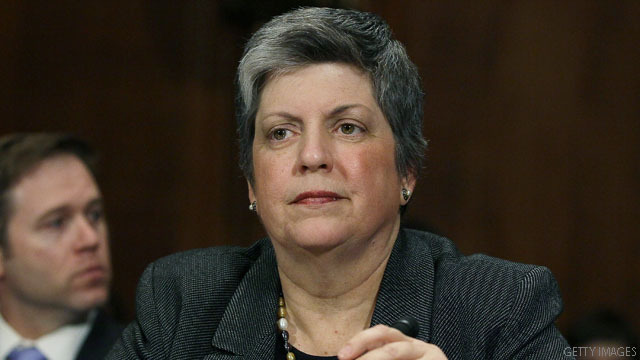 Department of Homeland Security Secretary Janet Napolitano acknowledged Friday her Luddite-like ways, despite the fact her position puts her in a critical leadership role when it comes to defending the nation's infrastructure from cyberattacks. Napolitano said she does not use email "at all." "For a whole host of reasons. So, I don't have any of my own accounts and that, you know, I'm very secure," Napolitano noted at a Washington conference about cyber security. "Some would call me a Luddite but you know. But that's my own personal choice and I'm very unique in that regard I suspect," Napolitano added. The Obama administration has been pushing Congress to revisit legislation that would have given DHS authority to enforce security standards. Legislation faltered earlier this year over concerns that it was too intrusive in requiring business to share data about intrusions, rather than it being voluntary. In the meantime, an executive order is being drafted by the Obama administration that would help clarify security standards, Napolitano said. She said President Barack Obama has not reviewed it yet. Napolitano said legislation would not dictate to companies how to run their security but rather would be a public-private partnerships to defend critical infrastructure. The United States has intelligence that Syria has moved chemical weapons for security reasons, Defense Secretary Leon Panetta said on Friday. Panetta said that intelligence shows movement at some sites. There has been "limited movement" at Syria's major chemical storage sites, Panetta said in response to questions from CNN's Barbara Starr. But the United States believes that the stashes remain secured by the Syrian military. Panetta added that the sites remain monitored by the United States and other countries. Over the couple of weeks, many major banks in the U.S suffered day-long slowdowns and been sporadically unreachable for many customers. The attackers, who took aim at Bank of America first, went after their targets in sequence, reports CNNMoney's David Goldman. Security experts say the outages stem from one of the biggest cyberattacks they've ever seen. These "denial of service" attacks - huge amounts of traffic directed at a website to make it crash - were the largest ever recorded by a wide margin, according to two researchers. A financial services industry security group raised the alert level to high in response to the attacks. The Islamist group Izz ad-Din al-Qassam Cyber Fighters publicly claimed responsibility for the attacks in what it called "Operation Ababil," but researchers are divided about how seriously to take their claims. The group has launched attacks in the past, but those have been far less coordinated than the recent batch.